Maximum removal and application design for control of cap tighness in container closure operation. It can be used with either molded , metal screw cap , or lug cap on glass , plastic or metal containers. The bottle is held in place with chuck jaws. The jaws will accomodate from 1/ 2 " minimum diam container to 6.5 " maximum. The pointer will show the torque in inch bs. required to apply or loosen the cap , depending on the model used. - Model 102 Maximum and Removal application ( Analog ) . 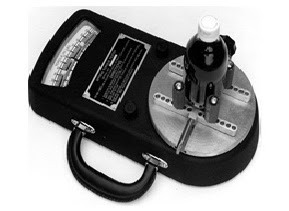 Calibration Kit 0 - 25 " Lbs.